Black container with internal divider and lock on lid. 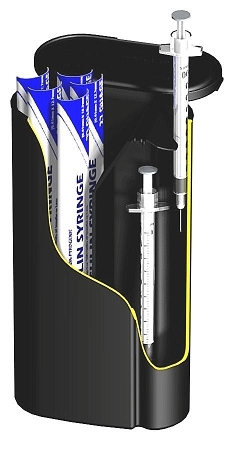 Holds up to 10 x 1ml syringes. 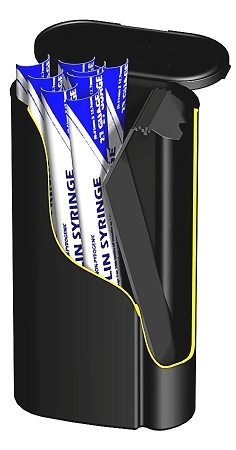 Equipped with patented syringe disposal flap and sliding divider system that allows for storage of both new and used 1ml syringes. 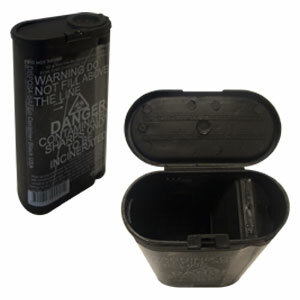 Compact high quality injection molded container complete with integral molded lid and handle. Impact, crush and needle penetration exceed AS4031:1992, BS7320:1996 CSA Z316.695.